Politicians and lawyers pretend that they are important people doing important work. But often they're important because they are parasites. They feed off others, while creating no wealth of their own. We all complain about businesses we don't like, but because business is voluntary, every merchant must offer us something we want in order to get our money. But that's not true for politicians and their businessman cronies. They get to use government force to grab our money. Those people who take instead of producing things make up "the parasite economy," says Cato Institute Vice President David Boaz. It's my favorite chapter in his new book, "The Libertarian Mind." The parasite economy, says Boaz, thrives wherever "you use the law to get something you couldn't get voluntarily in the marketplace." That includes much of the military-industrial complex, "green" businesses that prosper only because politicians award them subsidies, banks that can borrow cheaply because they're labeled "too big to fail" and -- unfortunately -- me. All of us are parasites if government granted us special deals. Some parasites (not me) lobbied for their deal. "You might use a tariff to prevent people from buying from your foreign competitors or get the government to give you a subsidy," says Boaz. "You might get the government to pass a law that makes it difficult for your competitors to compete with you." This quickly creates a culture where businesses conclude that the best way to prosper is not by producing superior goods, but by lobbying. Politicians then tend to view those businesses the way gangsters used to view neighborhood stores, as targets to shake down. Says Boaz, "You have politicians and bureaucrats and lobbyists coming around to these companies and saying, hey, nice little company you've got there, too bad if something happened to it. ... They start suggesting that maybe you need to make some campaign contributions, maybe hire some lobbyists, and maybe we'll run an anti-trust investigation, and maybe we'll limit your supply of overseas engineers. And all of these things then drag these companies into Washington's lobbying culture." And as I mentioned, it's not just companies that get dragged in. I built a house on the edge of the ocean. People weigh the costs and benefits of building in risky places like that. Without government's encouragement, I would have just built someplace else. But because politicians decided that government should be in the flood insurance business, and then other politicians decided that government's insurance business should offer cheap rates, I did build on the beach. Even though my property was obviously a high flood risk, my insurance premiums never exceeded $400 a year. Ten years later, my house washed away, and government's insurance plan reimbursed my costs. Today, the federal flood insurance program is $40 billion in the red. In other words, you helped pay for my beach house. Thanks! I never invited you there, but you paid anyway. I actually felt entitled to the money. It had been promised by a government program! But it was wrong, and I won't collect again. I don't want to be a parasite. But it's tough, because government keeps making offers. Government handouts make parasites out of many of us. Compare politicians and politicians' cronies to tapeworms and ticks. Like parasites in nature, the ticks on the body politic don't want to kill the host organism -- meaning us. It's in politicians' and regulators' interest to keep the host alive so they can keep eating our food and sucking our blood. 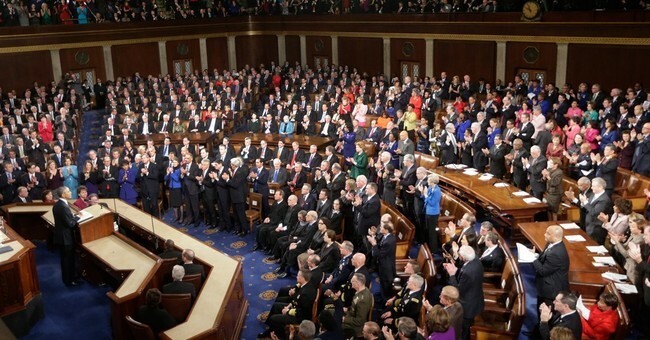 After watching members of Congress applaud President Obama during his last State of the Union address, I came to think that politicians were worse than tapeworms and ticks. The president bragged about American energy production being up. Domestic energy is up, but it's up because of private sector innovation, not government. In fact, it's up in spite of administration rules that make it harder to extract oil from public lands. Yet many in Congress applauded the president's misleading claim. At least tapeworms and ticks don't expect us to clap.